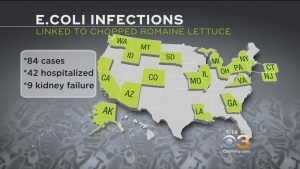 The FDA Reversed Rules That Could've Prevented All the E. Coli Outbreaks This Year to Protect "Big Ag"
Factory farm runoff is contaminating our lettuce and other produce with E. coli. The FDA reversed rules that would’ve made this illegal. Runoff from factory farm manure is getting into the water used to irrigate our crops, contaminating our produce with E. coli, salmonella, listeria and other deadly pathogens. This year it caused two major Romaine lettuce recalls. In years past it’s been green onions, cucumbers and other leafy greens, killing hundreds and sickening thousands. In the past food poisoning was limited to meat, but the pathogens from sickly animals in factory farms are now making it all the way into our salads. It starts with overcrowding animals, giving them poor diets, limiting sunshine and fresh air, and then pumping them full of antibiotics that create resilient pathogens. These pathogens multiply in festering manure lagoons. This sludge water is either sprayed directly onto crops or seeps into groundwater and wells used for irrigation on neighboring farms. The contaminated crops are then harvested and sold around the country. Under the Obama Administration, the U.S. Food and Drug Administration decided to do something about this in 2011 by creating a new rule requiring crop growers test their irrigation for pathogens. The new rule was supposed to go into effect in January of 2018, but under pressure from the agriculture industry, the Trump administration shelved the water-testing rules for six more years. Under the current plan, large growers do not have to start testing their water for pathogens until 2022. And they don’t have to stop using contaminated water on crops until 2024. Well, there is one reason… Delaying the new rules saves the agriculture industry $12 million per year. Meanwhile, is expected to cost consumers $108 million per year in medical costs, according to the FDA. “Essentially, it’s like a tax cut for growers and a tax hike for lettuce eaters,” notes TreeHugger.com. So it’s not so much the manure/fertilizer as it is the infectious manure from sickly animals? All warm blooded animals discharge e.coli. so no not just sick animals, they just make it worse. It might also be coming from the pickers going to the bathroom in the fields or handling the crops with contaminated hands. Very few things are picked by people. It’s all machinery. I’ve traveled all over the U.S. There are still many people picking by hand. The outbreaks are NOT the result of “modified” crops. Contact your local county extension service for info on home gardens. Baker creek seeds and cictory seeds are great places to get seed from. Start small. Just plant the lettuce you like. Add something else each season/year. Go to the library and read books. So, what is the solution????? Why write an article about a problem without proposing some sort of solution? That doesn’t make any sense to me and fells like it is only carping! The answer is quite obvious. Get rid of factory farms. Just like that lazy Paul Revere. Tell us what to do about it! Apparently a few need to work on the reading comprehension skills…..
“Under the Obama Administration, the U.S. Food and Drug Administration decided to do something about this in 2011 by creating a new rule requiring crop growers test their irrigation for pathogens. They did tell you what needs to be done though…. We need to pass legislation which requires testing the water now instead of in 2022. Then if they find contaminants they should be required to not use that water before 2024. That’s literally in the article. It is calling attention to the issue and explaining why it is happening. We must all call for the change to happen. The rule put in by Obama, requiring growers to test their irrigation water, would have gone a long way toward making produce safer. In their zeal to cut regulations, the Republicans decided to put off implementation of the rule for six years. Menwhile, we have an outbreak of e. coli that could have been prevented. What do you not understand here? The solution is to put the new rules in effect Now, not 2024. Are you serious? The answer is the USDA rule requiring crop growers test their irrigation for pathogens, at the very least, which was supposed to start in 2018, and was pushed back into 2022. Please read the article, perhaps twice, before being rudely commenting. You’re only making yourself look dumb. Put Obama Administration rules back in place. I’m surprised that there is no mention of climate change and lack if infrastructure being a contributing factor to rainfalls that, at times, can exceed levels of years prior, thereby infecting many crops. Not a federal issue. If you are a lettuce grower in Calif,Arizona, etc you should follow state ag laws. Stop blaming Trump for everything! Donna Voetee, the feds write the guidelines and states adopt those. States rarely write their own AG rules. This is a BS article. If the rule was passed in 2011 and it’s SO important then why did they wait until 2018 to implement it? And what about all the E. Coli outbreaks that happened in between? Who is to blame for those, Obama? Unfortunately, human’s love for eating meat isn’t going away, so we need to find a solution for raising large hoofed animals while also providing space non-farm animals. Big feedlots and confined animal feeding operations means less land taken from nature. If you want to pasture raise all cows, chickens, pigs (heaven-forbid), etc., you need the space to do it. Where I live 2000 lbs of animal needs 1 acre of pasture to survive and I live in a very rainy, eastern state. If all farm animals were to be pasture-raised, how do we keep the coyotes, mountain lions, bears, foxes, martens, etc., from eating them? Big feed lots protect the farm critters, concentrates the poop (unfortunately), but also frees up space for the wild animals we’d all rather see. One way to reduce the number of CAFOs is to legislate them out of existence and to charge what beef is really worth per pound for pasture grazing, which amounts to about $15 per pound for hamburger. I can’t believe what your saying. So, is nature going to feed you & your family? evidently your a city person & know nothing about feedlot or ranchers. people like you is why our country is being destroyed.nature is important but eating & surivdial is on the top of the list.IM MAD. Sorry, factory farming in not a good thing. Americans waste entirely too much food and are still overweight. We should be eating smaller portions and food grown closer to where we live. Big cities need to encourage neighborhood gardens on abandoned city blocks. There is so much more we should do. Phasing out factory farms is a start. This will only get worse with the continued urbanization of America. Out here in flyover country we eat locally raised grass fed meat as well as locally hunted venison. Our fruit and veggies are all grown within a hundred miles from here. Feeding the growing cities can only be done through industrial farming. Except that in the long run, it hurts farmers too, because people are now risk-adverse to buying lettuce. They heard that lettuce is bad, and they’ll stop eating it and buying it. That’s bad for everyone, of course, health-wise, but it’s killer for lettuce farmers. If they allowed grazing on public land, this wouldn’t be such a big issue. That’s what had the biggest impact on our meat industry. Our planet would be healthier, our cattle would be healthier and would have little need for all the drugs fed to them because of their close living quarters. It would reduce the breakouts of E Coli in our produce and lower the number of deaths and health care costs in humans. You never heard about this stufg when cattle were driven to graze. (Dr. Scott Gottlieb) He was sworn in as the 23rd Commissioner of Food and Drugs on May 11, 2017. I found this article and he and the FDA investigated and found these findings. https://www.fda.gov/…/News…/PressAnnouncements/ucm628400.htm. The article you wrote wants to blame the FDA..Whats the truth here?